His Holiness Sri Sri Ravi Shankar is touring the world as part of the celebration of the Art of Living Foundation‘s twenty-fifth anniversary. I spoke with him during his stop in Ottawa. Mark Blevis: In February of this year, two-and-a-half million people including religious and political leaders of all faiths and backgrounds gathered in Bangalore, India to celebrate the twenty-fifth anniversary of The Art of Living Foundation. I’m your host, Mark Blevis. On this edition of Portrait, humanitarian, spiritual leader, founder of The Art of Living Foundation and Nobel Peace Prize nominee, His Holiness Sri Sri Ravi Shankar. His Holiness Sri Sri Ravi Shankar: Things are in concept in the mind about peace and love, but how to bring that in day-to-day life and how to get rid of all the negativity, how to break down the barriers and prejudice against each other? What was bothering me was the prejudice that people had between urban and rural, between different religious groups or gender or race. I want to break down this prejudice in the minds of people and to become like children again and relate with each other with heart, sincerity and love. We find that stress is the main cause that blocks people. Lack of understanding is testimony to that. So, we put together this program, The Art of Living. It all began very simply. I just started teaching whatever I knew to a bunch of people in the drawing room and then word of mouth, it kept growing. Mark Blevis: It grew to two-and-a-half million people in one place. His Holiness Sri Sri Ravi Shankar: Yeah. Mark Blevis: You have mentioned religion. In your mind, is there a distinction between religion and spirituality? His Holiness Sri Sri Ravi Shankar: Yes. Spirituality is the essence of all religions. There is some common trait between all religions, it is spirituality, but in spirituality, you are in contact with the divinity deep within. Spirituality is honouring life. Spirituality is love and compassion, service. See? The communication or communion with God can happen only in spirituality. Religion is the external thing though the central part of every religion is spirituality, but unfortunately people are more stuck in the outer periphery rather than reaching the center chord. Mark Blevis: Do you think the concept of secular spirituality is threatening to religious leaders? His Holiness Sri Sri Ravi Shankar: They shouldn’t because they must be tired by now with all the conflict, you see. A religious leader cannot afford to think “only these people belong to me.” When a Catholic priest prays, he should pray for the entire population of the world, not just for only Catholics; or a Buddhist monk when he prays, he doesn’t pray only for his people. Or even for that matter, a Muslim imam or a Hindu priest. I feel when a swami prays or a priest prays, they pray for the entire world and if they are not, the prayer is not very fruitful. Mark Blevis: The other interesting point that I see mentioned in a lot of your literature is the blame culture. Do you think that we can get past the blame culture and what are ways that we can do that? 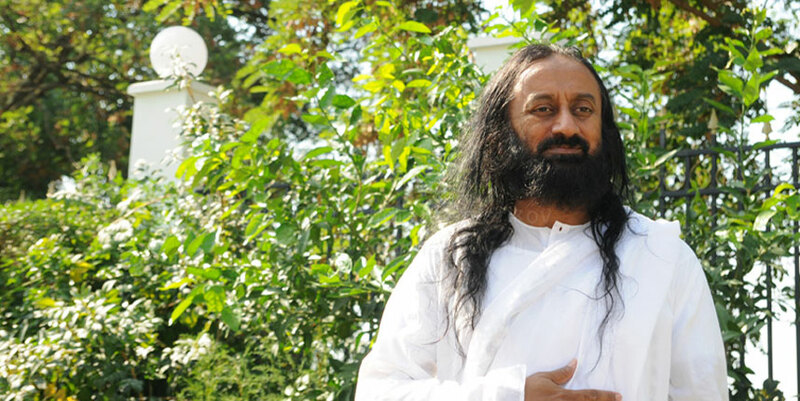 His Holiness Sri Sri Ravi Shankar: A stress-free mind will stop blaming. If you are stressed, you start blaming; either you blame yourself or blame somebody else. Wherever you begin you end up in the other. So, to get over the blame culture we need to be more compassionate. When you see a culprit is also a victim, when you broaden your horizon, you will see that every culprit is also a victim. So then you can’t be angry on a victim. You will not take revenge on a victim. Inside every culprit, there is a victim crying for help. We need to heal that victim. Help them out. Non-violence and compassion should be the guiding force. If this is prevalent in our society, we can definitely make a difference. It may sound very impractical, but we will have to move in that direction because non-violence is — nobody likes violence for themselves, but we need to bring those values in life. It has to come from education and from culturing. Just for example, nobody litters in Ottawa, but if you go to third world countries, people are littering. What is the difference? Because that has been a part of education. Everyone, mostly, follows the rule and they drive on the right side here and left side in England and that’s a matter of education. Similarly, dental hygiene, the physical hygiene we teach, but we are not teaching mental hygiene where you should handle rage and anger and frustration and depression and these sorts of antisocial feelings. That’s where yoga, meditation, breathing, all these techniques will be of immense help to bring such a balance in the mind and softness in the heart and behaviour. Mark Blevis: At your Silver Jubilee back in February, you had two-and-a-half million people in India and among them were religious and spiritual leaders and people of backgrounds of every sort. What was it about the Silver Jubilee that drew all these people to one place and to one mind? His Holiness Sri Sri Ravi Shankar: You know, Silver Jubilee was to be celebrated and we have known people would all be coming from all over the world because anywhere we had to celebrate, somewhere we had to begin that. So, we had to make the big arrangements for that and we invited religious leaders. They readily accepted and we had nearly one thousand religious leaders of all denominations and many political leaders and three-thousand-eight-hundred musicians all on the same stage. Yeah, I know, you look back now and see it’s a humongous task. Mind you there was no traffic jam even. There was no incident. That was what somebody asked me in the Belgium Parliament. He said, “Here in Belgium, we have a soccer game where ten-thousand people coming, there are a hundred casualties. We need to have five hundred police. How could you manage 2.5 million people?” I said, “The peace and silence and the non-violence as main theme and goal will make everyone move in that direction.” I think it’s our intention when we want to bring that non-violence and meditation as part of our event in the society, people will get into it. Mark Blevis: Has anything changed in the world or through your organization since the Silver Jubilee? His Holiness Sri Sri Ravi Shankar: A Silver Jubilee is just an event, but a lot of social work is happening through the organization whether in tsunami or recent flooding in parts of India or earthquake or bomb blast, train bomb blast. Trauma relief work is going on. We are keeping the temper cool on the planet wherever we can reach. Of course, Israel and Lebanon we are not able to reach as much as we would love to. We need more volunteers. Generally, I feel the stress and depression level wherever we have started working have tremendously changed. I still feel what we are doing is just a drop in the ocean. There is a lot be done, a lot to be done in this field to educate people, to handle their emotions and to be happy and compassionate. Mark Blevis: Show notes and links to resources discussed in this episode can be found on my website, electricsky.net. While you’re there, be sure to check out my podcast archives. The theme song for Portrait is Bigfoot by Robert Farrell. Electric Sky is a proud member of the Rogic Podcast Conglomerate. Thanks for listening and please stay subscribed. I have read many books of sri sri ravi shankar but i felt nothing spiritual. I get nothing out of those books.I can’t understand the god. Why i am here? I think that the thinking of atheist is more better than theists. I have attended one of course of art of living but even there i felt nothing. Gurudev,My brother in law is suffering from several diseases, he is taking no of medicines but not cured,please help me. I see that he’s in the trailer and says , “Religion is like the banana skin. Spirituality is the banana.” I think that is pretty much my view of so many religions. He is a genius and a boon for the mankind. Only a great soul like his holyness can bring peace and love on the earth in this Kaliyuga!! Thank GOD for this invaluable gift.